Hawaii is a great place to go to school — and not just for the scenery. These schools are the state’s best four-year colleges by earning potential. Want to go to college in paradise? If surf, sand and lots of Spam sounds like the perfect setting for a college education, you might want to seriously consider a college in the Island State as the place to earn your bachelor’s degree. And as long as you don’t spend too much time at the beach, you can set yourself up for a successful career in addition to getting a killer tan. 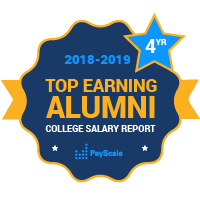 PayScale’s College Salary Report has data about the alumni salaries of college in Hawaii. The University of Hawaii at Manoa is the largest college in Hawaii. Hawaii Pacific University, a private not-for-profit college with about 8,000 students, is close behind. Most people associate Hawaii with sports like surfing, kayaking and other ocean activities. However, the University of Hawaii at Manoa is home to one of the most colorful teams in the nation, the Rainbow Warriors, and they compete in Division 1 Football in the Mountain West Conference. Hawaii Pacific University is home to the Sharks, and they compete in several Division II sports leagues.